1 FOOT PAIN: does footwear choices make a difference? FOOT PAIN: does footwear choices make a difference? Pain or discomfort can be felt anywhere in the foot. You may have pain in the heel, toes, arch, instep, or in sole of foot. Foot pain is common problem , and one of the common musculoskeletal conditions that is being treated by physical therapist. It is highly prevalent in older population, as one in three people aged above 65 years experienced foot pain. , Multiple factors may responsible for producing foot pain like increased age, gender, ill-fitted footwear, obesity and chronic degenerative diseases. The incidence of footpain in US national health survey (1990) and the Framingham foot study (2009) have shown 24% and 28% of participants reported generalized footpain without any obvious underlying pathology, respectively. The more recent survey conducted by American Podiatric Medical Association (2014) have shown that 8 in 10 US adults experienced foot problems including pain as third most common complaint. The Cheshire random community based survey (2004) revealed that 10 percent of the participants between age 18-80 reported “disabling” foot pain. A study held in Northwest Adelaide, Australia indicated that one in five people over age 18years have reported foot pain with higher prevalence in females. The prevalence of foot pain has also been seen among randomly selected Danish (2010) population aged 18-80 years with prevalent rate of 30.4%. In Asian population, 50 percent of young urban working women reported recurrent non traumatic foot pain and 68.4% believed that the pain is associated to the footwear they worn at work. There are strong supportive evidences that women are susceptible to have footpain that may be associated to variety of footwear they use throughout the life span and this may be due to increased weight and lower pain threshold. ,.,13] Evidence of footpain experienced in male population have also been seen as 19% men in Framingham study and Australian study showed 15% of men reported foot pain. 49% of US women wear high heels that is 3” or more and 71 percent of total women experience foot pain attributed to high heels. The consequential negative effects of wearing shoes with elevated heels also includes sprained ankles, low back pain, leg pain due to more weight placed on the toes, shortened Tendo-Achilles, unstable gait pattern and balance as well as increased energy consumption. It has also been evident that wearing high heels and shoes with pointed toe box to be associated with the development of corns, lesser toe deformity and hallux valgus (bunion). The shoe toe box (shape and volume) is also significant in terms of producing ill-effects on foot’s health similar to high heels. Decreased volume of toe box causes cramping of the toes that has been linked to produce foot deformities, joint pathologies and forefoot lesions. Development of metatarsalgia, callus formation and higher risk of ulceration under metatarsal heads have also been shown to be related with increased forefoot plantar pressure. Hammer toe deformity, where interphalangeal joint become prominent and toes curls downward produces pain and callus because of the irritation caused by footwear. Shoes with pointed toe box significantly produces higher peak pressure at the medial heel area than any other shoe. Hyperkeratotic skin around 5th digit is thought be due to the shoe toe box style. 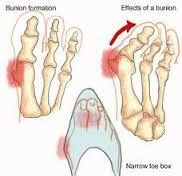 A significant association of 43 per cent have been found between the shoes with narrow toe box and hallux valgus (bunion formation). Many previous studies have given enough evidences that foot wear choices are highly influenced by fashion trends including color matching, comfort and brand therefore the problems associated with footwear may vary from different types of footwear and their frequency may influence by the period of specific fashion trends. Body image and emotional influences also seems to play a critical role while choosing footwear especially among females. It has been found that orthopedic footwear has direct impact on the self-esteem and body image of people who are being prescribed and only 5% of the participants choose to wear prescribed footwear as it feels unattractive to them and they would rather prefer to go with fashion trends. On the contrary, the strong emotional connection has been found between the footwear and body image among the participants who owns high heels and flat ballet shoes, describing their feelings as “content and cheerful”. In an extreme end, cases of removal of fifth digit in order to fit in desired footwear have also been reported. Among the footwear choices, high heels and pointed toe box shoes are characteristically two most common footwear that mostly women owned. High heels remains the top notch footwear choices that is evident in literature. In APMA survey (2014) the average US woman owns 9 pairs of high heels. Another study shows that 60% of women owned high heels, sandals and slippers which were categorized as “poor” footwear choices with potential impact on foot health. However, teenagers’ prefer to have flat ballet pumps for school. It is evidently proven that different types of footwear impacts differently on foot’s health and the prevalence of footpain is increased comparatively from past years. It may be associated due to higher variation among footwear designs and style. It is also observed that fashion trends and overall body appearance have great significance in making choices of purchasing footwear. There’s a need to create awareness among general population to make appropriate footwear choices that fit in properly and accommodate biomechanically. 1. C. Benjamin Ma,David Zieve,Isla Ogilvie. foot pain. http://www.umm.edu (accessed 27 may 2016). 2. APMA. Public Opinion Research on Foot Health and Care Findings from a Survey of 1000 US Adults. edge research 2014. 5. Chatterton BD, Muller S, Roddy E. Epidemiology of posterior heel pain in the general population: cross-sectional findings from the clinical assessment study of the foot. Arthritis Care Res 2015; 67(7). 7. Burns SL, Leese GP and McMurdo ME. Older people and ill-fitting shoes. Journal of Postgraduate Medicine 2002;78: 344–346. 11. Mølgaard C, Christensen SL, Simonsen O. High prevalence of foot problems in the Danish population: A survey of causes and associations. thefootjourna 2010; 20(1). 13. Branthwaite H, Chockalingam N, Greenhalgh A. The effect of shoe toe box shape and volume on forefoot interdigital and plantar pressures in healthy females. J Foot Ankle Res.2013;28 (6). 14. Price C, Andrejevas V, Findlow AH,Graham-Smith P,Jones R. Does flip-flop style footwear modify ankle biomechanics and foot loading patterns?. Journal of Foot and Ankle Research 2014; 7:40. 15. Shroyer JF, Weimar WH: Comparative analysis of human gait while wearing thong-style flip-flops versus sneakers. J Am Podiatr Med Assoc 2010, 100:251 –257. 18. Chang-Min Lee, Eun-Hee Jeong, Andris Freivalds. 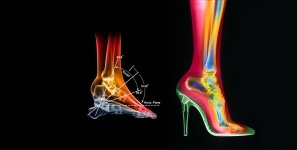 Biomechanical effects of wearing high-heeled shoes. International Journal of Industrial Ergonomics 2001; 28(6). 20. Paiva De Castro A, Rebelatto JR, Aurichio TR: The relationship between foot pain, anthropometric variables and footwear among older people. Appl Ergon 2010, 41:93–97. 22. Burns SL, Leese GP and McMurdo ME. Older people and ill-fitting shoes. Journal of Postgraduate Medicine 2002;78: 344–346. 23. Menz HB, Roddy E, Marshall M, Thomas MJ, Rathod T, Peat GM, Croft PR. Epidemiology of Shoe Wearing Patterns Over Time in Older Women: Associations With Foot Pain and Hallux Valgus. J Gerontol A Biol Sci Med Sci 2016.